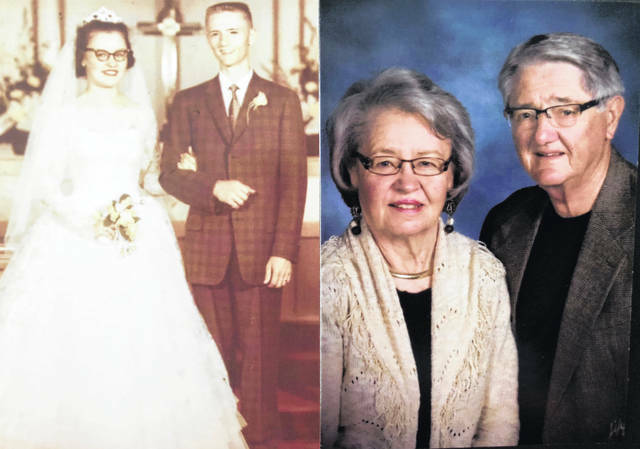 ARLINGTON — Mr. and Mrs. Jerry Beagle are celebrating 60 years of marriage with a family trip this summer to Myrtle Beach, South Carolina. Beagle and the former M. Joyce Traucht were married June 15, 1958, at Good Hope Lutheran Church, Arlington, by the Rev. Willard Drefke. They are the parents of five children, Jennifer (Ronald) Bower, of Jenera, Jon Beagle, of Winona, Minnesota, Joseph (Leslie) Beagle, of Bowling Green, Joni (Jonathan) Winfrey, of Broken Arrow, Oklahoma, and Jason Beagle, of Broomfield, Colorado. A son, Jeffery Beagle, and a daughter in law, Eunice Beagle, are deceased. They have 18 grandchildren and a great-grandchild. A grandchild is deceased. Beagle is retired after working at Cooper Tire and Rubber Co., Village of Arlington Clerk and as an insurance agent. His wife is retired after working as a bus driver and at Things and Pills.